Pharmaceutical pricing has always been a hot topic, one that often leads to a lot of finger pointing and little in terms of real action. President Trump has attacked high drug prices on the campaign trail and if the democrats re-take the house in November, that might be one thing they can agree on. 2019 may be another year when drug makers, insurers and PBMs are blasted by the media and politicians for high drug prices for patients. Remember 2015 and the controversy about the price of Sovaldi, a new treatment for hepatitis C (HCV)? After an 18-month investigation into Gilead Sciences’ pricing practices, the US Senate finance committee had released their report in December of that year. It never led to anything but was a public relations nightmare for Gilead. That same year, health care officials, infectious disease specialists and some politicians were protesting Turing pharmaceuticals’ decision to raise the price of Daraprim, a 62-year-old medication used to treat toxoplasmosis from $13.50 a pill to $750. Valeant (now Bausch Health) was also accused of jacking up prices of Nutropress and Isuprel by 212% and 525% respectively. In general, new treatments for life-threatening diseases such as HIV, HCV, cancer or multiple sclerosis to name a few, seem to be able to command high prices. Sovaldi and the combination pill Harvoni are not the only expensive drugs on the market. All multiple sclerosis (MS) treatments cost more than $50,000 per year, hundreds of thousand dollars over the life of an MS sufferer. Newer small cell lung cancer treatments such as Xalkori from Pfizer and Zycadia from Novartis cost more than $100,000 a year. All new tyrosine kinase inhibitors (TKR) for the treatment of Chronic Myeloid Leukemia (CML) also cost in excess of $100,000 per year. Older drugs such as Rituxan, Herceptin and Avastin from Roche/Genentech that launched the era of targeted therapies for cancer easily run at more than $100,000 per year when infusion costs are included. The list goes on and on. So how is the price of these new medications determined? Are the high prices for pharmaceutical products a US phenomenon or is it the same in other similarly wealthy countries? Specialty drugs are getting more and more expensive but is the overall cost of prescription medicines rising too? Is it reasonable and sustainable for the healthcare system to charge high prices for breakthrough treatments? What can we expect in the future? The following sections will address each of these points. Pricing is arguably the most important component of the marketing mix since it is the main revenue-generating element. Price low and significant revenues will be left on the table. Price high and payers’ restrictions, physicians’ complaints and patient abandonment at the pharmacy will drastically cut acceptance and market penetration. High pricing can also lead to PR issues, damaging the image of a company while at the same time diverting management’s attention. However, pricing a product right will lead to a large acceptance from payers, physicians and patients and a significant market share. There are many pricing strategies that can be applied, depending on the drug type, the company’s objectives, the competition and the market. Because of the specific distribution and selling structure of pharmaceutical products, four can be used to set drug prices: cost-based pricing, value-based pricing, competition-based pricing and price skimming. Simply put, cost-based pricing consists of adding up the cost of all expenses incurred to bring a product to market and adding an acceptable profit on top. Typically, research, development, manufacturing, packaging, distribution and sales & marketing costs are used for the calculation of the price. The added profit margin is generally based on the company’s own objectives or target, or what is usually acceptable for the type of product and market. The problem is that the cost of manufacturing, packaging and distribution is low for pharmaceutical products. Even the cost of manufacturing for biologics has gone down in the last few years. Research and development costs cannot justify prices for most products especially specialty products. $2.6 billion in fully loaded R&D costs per product is often quoted but the real cost for each single product is usually much lower. For all these reasons, this pricing structure is never used for pharmaceutical products. It’s frequently used for medical devices and sometimes for diagnostics but for drugs, even generics, it’s not used. The first technique consists of understanding the perceived value of the product by key stakeholders and to what extent a price premium can be applied. Well-designed market research with payers, physicians and patients is critical to understand the perceived value of a product and the roadblocks that may have to be overcome. In the end, there is always tension between setting a slightly lower price than the research suggests in order to minimize challenges and facilitate rapid acceptance and staying true to the data. The other technique, only applicable in the pharmaceutical industry, consists of using pharmacoeconomic data. More specifically, the potential cost-savings that the product would bring to the current management of the disease are calculated in order to extract an acceptable and hopefully premium price. Unfortunately, using pharmacoeconomic data to set a price is rarely simple. Pharmacoeconomic benefits are often hard to calculate. Costs of care vary from one payer or even one hospital to another and a unified pricing strategy based on such calculations is hard to come by. Besides, the US healthcare system is so fragmented that drug payers rarely care about overall healthcare cost savings. For some products such as oncology drugs, another issue consists of assessing the value of a month or year of life saved rather than looking at cost-savings. Some health services, particularly in Europe like the NHS in the UK have come up with a way of assessing the value of each extra year of quality life or quality adjusted life year (QALY). While it’s an interesting concept, there is one major problem with this, however. The value assigned to each QALY will vary from one payer (in this case country) to another depending on the medical practice, cost of services and ways of accounting for these costs. Another issue has to do with the true value of medical breakthroughs or cures and whether healthcare payers will be willing to pay a fair price for such drugs. We already got the beginning of an answer with HCV! Most payers were not willing to pay for the true benefit of Sovaldi, one that can cure up to 95% of patients. Whether our healthcare system will be willing or able to pay upfront to save money over the next 10 to 20 years remains to be seen. While value-based pricing is used in one form or another by most drug companies, the use of pharmacoeconomic data is not common. In some countries like Canada, Australia and some European countries (UK, Germany, France soon), pharmacoeconomic justification for a product’s price is often required. However, pharmaceutical companies too often use pharmacoeconomic data to try to justify a target price, not to calculate one. Instead, stakeholder research is most often used to determine an acceptable price range for a new compound. That may well change in the future considering the slow but steady shift made by some important payers. Companies will be required to demonstrate value in order to get reimbursement for their products. Even in the US, independent review boards such as the Institute for Economic and clinical Review (ICER) are starting to have an impact. With the exception of products entering a market without competition such as orphan drugs, it’s hard to imagine pricing a new compound without taking into consideration its competitors. Rarely used alone, competitor-based pricing is usually a component of value-based pricing. When testing the perceived value of a new product, its potential benefits are benchmarked against its current competitors. That perceived value becomes a key element of the new pricing. One of the challenges is that the perceived value may not be acceptable in the real world regardless of the strength of the data. A breakthrough product with a significant price premium may still face restrictions from payers preferring a lesser, older product solely based on price. And that’s one of the challenges faced by pharmaceutical companies when setting a new price. Should you price your product based on its perceived value and face possible barriers to easy access, or instead price it closer to its main competitor and avoid any restrictions or potential PR issues? There are benefits to both strategies but certainly the second option is not applicable if your main competitor is a generic. If your main competitors are branded products, their price can be used as a starting point to set up your own pricing. Whether you product is priced higher or lower than the competition will then depend on its perceived competitive value by key stakeholders. If there is no product benefit, obtaining preferred status is often too costly. Besides, any price discount can always be matched or exceeded by your competitors. In that case, roughly matching the price of your competition and relying on your marketing strategy to push your product is often preferred. If you product is superior, then the hard sale is to convince payers to accept a price premium without restrictions. Skimming pricing consist of maximizing margins in an attempt to extract as much profit as possible. This strategy requires a lack of strong competition or no competition at all. It’s also easier to apply in a smaller market where volumes will be limited. In larger markets the sheer volume that your product can command can be a clear challenge to the health of the market itself and push back from payers will happen. Being a breakthrough product in a market with limited to no competition can be a dream come true and a curse. The challenge will be to maximize your price while minimizing volume control and any PR nightmare. While the techniques used to develop a pricing strategy for a new product are well known, the push in the past few years has been towards refining the tools and methods employed to develop value-based pricing strategies. However while many payers outside the US will want to see some overall cost-savings from a new medication to justify a price premium, in the US the overall healthcare savings argument has yet to become a key driver. And that’s where the real challenge often lies: balancing the payers’ objective to minimize their budget exposure while trying to extract as much as possible from the perceived value of a product. One often hears that the price of pharmaceutical products in the US is higher than in other developed countries such as Europe and Canada. A figure of “twice as expensive” is often quoted. But is it really true, at least for newer innovative drugs? If we take the example of Sovaldi, it was priced at $84,000 in the US when it launched but that’s not the price that payers payed. This Average Wholesale Price (AWP) is the sticker price but it doesn’t reflect the true price of the drug as the medication is heavily discounted. The most important price is the Average Selling Price (ASP). Gilead reported that the average discount for Sovaldi in 2014 was 22% and in excess of 40% in 2015, meaning real prices of $65,000 and less than $50,000 respectively the first and second year after the launch following additional pricing pressure from competitors– today’s discount is more than 60% (or a price below $30,000). Comparing this average US price at launch to the launch price in the top three European countries shows very little difference (see Figure 1). Same for Japan where Sovaldi was launched at around $43,000/year. There is little price discounting in Europe since all prices are negotiated upfront, although with NICE (the National Institute for Health and Care Excellence) in the UK and IQWiG (Institute for Quality and Efficiency in Healthcare) in Germany this is changing. If a product is not deemed cost-effective by these two watchdogs, discounts are requested in order to maintain reimbursement. Additional measures can also be taken such as volume based pricing discounts or exceptional taxes that can be leveraged on a manufacturer if revenue thresholds are reached. In addition, some European countries are starting to implement budget caps. In Japan, while drugs are usually launched bearing high prices, discounts are applied in subsequent years. 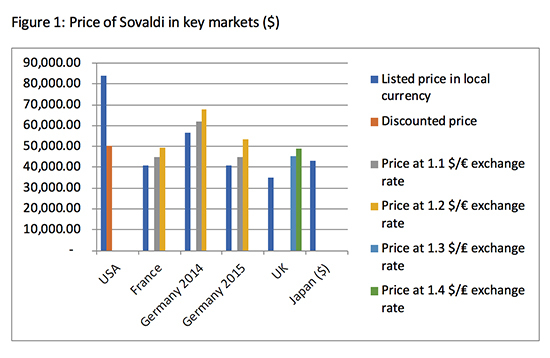 For example, the price of Sovaldi was quickly reduced by 30% due to high volume sales in the early months of its release. This pattern is seen with most new specialty medications. When looking at Olysio, another HCV product, or Yervoy for melanoma and Zytiga for prostate cancer, we observe a similar trend (Table 1), although in most cases, prices in Europe tend to be lower. However that pattern of price alignment gets disrupted over time for one simple reason: price increases are allowed in the US while prices are frozen in Europe or Japan and sometimes, as we’ve explained, discounted further if volumes exceed targets. With yearly average price increases in the 6 to 8% range in the US (some years in the double digits), the difference between the US price and prices in other developed markets widens very quickly. Let’s take the example of a hypothetical $100/month drug in the US at launch that would be available at a 30% discount in Europe because of price negotiations. After 10 years with average yearly price increases of 8%, the US drug would cost $216/month while in Europe it would still be $70 or 3 times less! And drug costs can increase even more significantly. A shift towards value-based pricing in most developed markets has allowed truly innovative products to claim premium pricing at launch. In major European countries and Japan, some companies have been able to obtain prices that are generally close to US discounted prices. However in those countries, price controls have limited potential price increases over the products’ patent life while in the US, reliance solely on market dynamics has not. Over time, this results in significant price differences between the US and other developed countries. 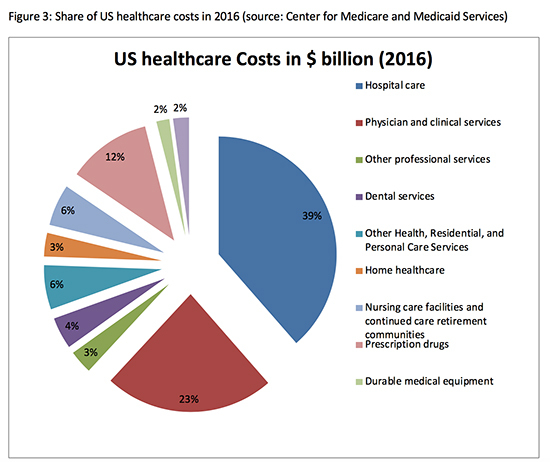 It is well known that overall healthcare costs in the US are much higher than in other developed countries. Both when looking at per capita costs and share of GDP, US healthcare costs are double what they are in other countries (). However, the share of prescription drugs has been hovering between 10% and 12% of overall costs and is not the main reason for these disproportionally high expenditures (see Figure 3). In fact, the growth in drug costs has been consistently lower than other healthcare services over the past 5-7 years. Why is that? The main reason is the increased usage of generics. Generics now represent about 90% of total prescriptions in the US and their share has been steadily increasing, from 65% in 2005 to 90% in 2017 according to IQVIA. This is mostly due to the patent expiration of several blockbusters in the past few years, but with share at 90%, we’ve already seen most of the benefit. At the same time, the rise of expensive specialty drugs is pulling overall prescriptions costs in the opposite direction. This is not a short-lived phenomenon. There are many such medications in the pipeline that should be launched within the next 5 years. And several of those are biologics, generally more expensive drugs. The arrival of Biosimilars may help offset some of that growth but a smaller 20% to 30% discount is expected, far from the 80% discount seen with small molecule generics. Generics have helped contain the rise of drug expenditures. Unfortunately the ever increasing use of more expensive specialty medications combined with the expected lesser impact of Biosimilars on drug costs will inevitably lead to higher drug spending. Specialty drugs are expensive and will continue to be. Even when targeting a smaller population base, their impact on drug expenditures is being felt. Payers react by restricting access, increasing copays and demanding ever larger discounts. At the end, patients suffer. The federal government, afraid that these new medications may bust their budget will also have to respond. More pushback from patients, physicians and politicians is also very likely. This public outcry will be displayed on the front page of newspapers further damaging the public image of drug developers. But regardless of the finger pointing, the share of drug expenditures in overall healthcare costs is still relatively small and is likely to remain that way even if it inches up slightly. Some of these new specialty medications are real breakthroughs, sometimes cures and should be valued as such. Those are worth the upfront costs, leading to better outcomes in patients, fewer physicians’ visits, laboratory tests, less hospitalizations, hence reducing overall healthcare costs. Some drugs like those for neurodegenerative disorders can keep patients healthier and active longer, benefitting society as a whole. HIV medications have turned a deadly infection 25 years ago into a manageable disease today. New HCV treatments are curing patients so much so that the market has shrunk significantly. On the other hand, the story is quite different in oncology. We’ve seen some improvement in the management of hematologic cancers where targeted therapies have had the most impact. But in solid tumors, treatment protocols haven’t changed much over the last 15 years. In the most common breast, lung and colon cancers, targeted therapy hasn’t had much of an impact on overall survival and it’s hard to justify very high prices. What it comes down to, is a case by case analysis of the cost benefit of each of these new drugs. Some high prices can be justified, some may not. One thing that is hard to justify is the yearly price increases of older products, sometimes in the double digits. The value proposition doesn’t change overtime. Take the example of multiple sclerosis: the yearly cost of treatment is about the same whether it’s an injectable or an oral product and regardless of the side effect profile or efficacy of the compound. One reason behind this is multiple yearly price increases of older products. In most other developed countries, price increases are not allowed, leading to a significant reduction in drug expenditures but still leaving room for premium pricing of better products, thus rewarding innovation. In the context of this ever more difficult pricing environment, the real risk for pharmaceutical companies is more regulation. Certainly we’ve already seen it in Europe with NICE and IQWIG for example. Some European payers are asking for more value-based pricing assessments in order to grant reimbursement; volume-based discounts and/or caps on sales are also frequent. We haven’t seen such regulations in the US yet. The federal government is not inclined to regulate and cannot negotiate drug prices for Medicare beneficiaries, but things may change as President Trump recently hinted. The Center for Medicare and Medicaid services (CMS) is looking into various “value-based” methods. Considering the large and growing number of Medicare patients, either change would definitely impact overall pricing. Tougher negotiations with payers are also expected in the future. Purchasing may become more centralized. Federal based programs are also extracting larger discounts from manufacturers. Most of the discussion about drug pricing focuses on the sticker price. Rebates and discounts are never taken into account. Stakeholders, other than payers, have very little knowledge of the real price of pharmaceuticals. And as we’ve seen, the difference between the sticker price and the discounted price can be significant. This lack of transparency is an issue and may become a liability. It’s time for pharmaceutical manufacturers to change the dynamic around pricing. Better communication around the “net” price is needed in order to alleviate fears around premium pricing practices. Companies also need to be better at communicating the value of their products. Gilead’s problems about its HCV pricing was partially due to poor communication on the value of their drug. Determining the value propositions for a compound as early as in phase 2 and how much they’re worth is critical. Limiting yearly price increases (in line with the CPI for example) would also be received favorably by stakeholders. It would, over time, impact overall drug costs and reinforce an image of innovation rather than one of self-indulgence. Accompanied by proactive communication, it would portray a more positive and socially responsible pharmaceutical industry. While self-regulation is always difficult to implement industry-wide, it has been done in the past. Lastly, demonstrating value should be a prerequisite for premium pricing. Stakeholder interviews should no longer be the driver behind pricing decisions; patient outcomes and cost benefits should. Health outcome measurements are too often used to justify a high price; they should instead be used to determine an appropriate price. If pharmaceutical companies don’t take this approach, someone else will do it for them. ICER analysis of new PCSK9 inhibitors has already forced companies to lower prices. It’s time for pharmaceutical companies to change the discourse from one of “cost of treatment” or “cost per year” to one of “cost-savings”. Pharmaceutical pricing will remain a controversial topic unless the industry starts changing the way it prices its products and regulates itself to avoid excesses. Until then, more negative headlines and finger pointing will continue. Rebates, discounting and restricted access will also intensify. It may eventually pave the way for giving the US federal government additional negotiating power and passing new measures aimed at limiting companies’ pricing freedom. Not something that the industry is looking forward to. Bruno Delagneau, M.D. is currently a consultant for pharmaceutical and biotech companies. He is the former CEO and founder of Idekos, a privately funded biotech company and a former Vice President at Gilead Sciences. The author would like to thank Steve Slovick from Jupiter Health for reviewing this paper and providing thoughtful comments.